Trade finance banks are providing ever-more diverse and innovative services as world trade continues to expand. On January 1, 2008, the multilateral trading system reached its 60th anniversary. Any celebrating was subdued, however, in light of the slow going in the Doha Round of trade talks and persistent protectionist rhetoric by US politicians. Nonetheless, globalization continues to spur rapid growth in international trade and an increasing need for trade services and finance. World trade has grown 27-fold in volume terms since 1950, three times faster than world output growth, according to the Geneva-based World Trade Organization. Under the WTO and its predecessor, the General Agreement on Tariffs and Trade (GATT), multilateralism in trade has contributed significantly to post-war prosperity, although it still faces formidable challenges, according to the WTO’s annual World Trade Report, released in December. “By striking an ambitious and development-oriented agreement in the Doha Round, we can greatly strengthen a system which has done much to make the world a better place,” WTO director-general Pascal Lamy said in a release accompanying the report. But the GATT and the WTO have not done all they could, particularly for developing countries, according to Lamy. “In the coming months, we have the chance to deliver more for our member governments and the citizens they represent” by reaching an agreement in the Doha Round, he said. Agricultural trade liberalization has proven particularly challenging, and the results have been limited so far, according to the WTO report. Similarly, trade in labor-intensive manufacturing still faces relatively high trade barriers in major markets, it says. These issues need to be dealt with and new issues will emerge in the future, likely including the relationship between the environment and trade, as well as energy and trade, the report says. As cross-border trading expands, trade bankers are playing an increasingly sophisticated role in keeping global supply chains running smoothly and providing working capital for suppliers in emerging markets. 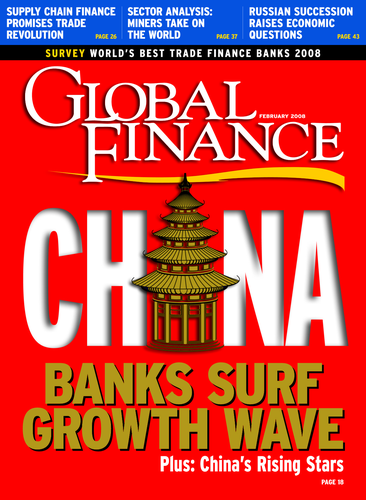 In our eighth annual survey of the World’s Best Trade Finance Banks, Global Finance editors, with input from industry analysts, corporate executives and technology experts, chose the leading trade finance banks in 67 countries or regions, as well as the best online trade finance provider. Criteria for choosing the winners included transaction volume, scope of global coverage, customer service, competitive pricing and innovative technologies. As corporate buyers and sellers shift to open-account trading, banks are using their global networks and risk-management abilities to facilitate transactions and ensure that sellers collect timely payments from distant buyers. Meanwhile, the best banks continue to offer a full range of traditional trade products, including letters of credit, performance guarantees and documentary credits. In the future, bankers will continue to work closely with freight forwarders and transportation companies to keep track of goods in transit and maximize opportunities for additional financial services. Knowledge of local markets and procedures and an understanding of their customers’ business needs are key ingredients for success.